From the initial start to finish we felt totally relaxed even though we needed the shop up and running quickly! The team delivered what we wanted and more. We even had flat ceilings and walls in a 150 year old building that had suffered subsidence! An excellent job. The installers were extremely polite, did a great job and were a credit to the company. The quality of the doors and windows was extremely good and great to hear that they were sourced locally. All in all, great service and value for money. I would have no hesitation in recommending NatCon. We had problems with our shower room and NatCon came, took it all out and re-tiled it for us. Since then no problems and good workmanship. They worked till 9pm so they would not need to come back and disrupt us for two days. That is very unusual for workmen – they normally vanish at 4.30!!! The service was fantastic and the work force efficient and polite. We were kept informed of progress all the way through the build and the finished product is excellent. Dominic and his team of installers are absolutely fantastic. I am extremely pleased with the quality of the product and of the installation of my doors. I was very wary when I first got NatCon to quote as I assumed it to be a national company and not a local one. 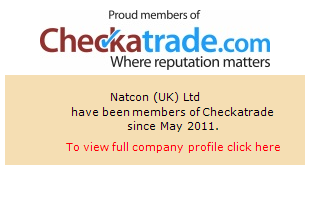 How wrong I was and I am so glad that I trusted the feedback of others on Check-a-Trade.